"The pool of reviewers is increased by constant refreshing of the editorial board and asking junior researchers to review." Maturitas was founded in 1978 and is the official journal of the European Menopause and Andropause Society (EMAS). It is also affiliated with the Australasian Menopause Society. The journal Impact Factor of 2.844 ranks it 14 out of 77 journals in Obstetrics and Gynecology and 19 out of 46 journals in Geriatrics & Gerontology. Submissions to the journal are running at around 500 per year, with academic institutions annually downloading more than 381,000 articles on ScienceDirect andwww.maturitas.org registering 238,765 article pageviews by subscribers. Maturitas Editor-in-Chief Professor Margaret Rees is a Reader Emeritus in Reproductive Medicine and a Fellow at St Hilda's College, at theUniversity of Oxford. 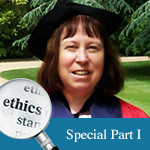 Her ethics experience is extensive – she is Secretary of the Committee on Publication Ethics (COPE), Chair Elect of the Association of Research Ethics Committees (AREC), and member of the Open University Human Research Ethics Committee (HREC); the Central University of Oxford Ethics Committee (CUREC); and the Elsevier Ethics Committee. A. I have been Editor-in-Chief of a journal since 1998. For the first 10 years I edited Menopause International and since 2008 I have edited Maturitas. Maturitas is a well-established international journal which allows regular interaction with cutting-edge researchers. The editors and editorial board provide an excellent multidisciplinary team. So what is most rewarding is being able to select high-quality articles for publication, thereby stimulating interest in the journal and encouraging the junior researchers, who are our future. Q.What are your biggest challenges as Editor-in-Chief of Maturitas? How do you overcome these challenges and what extra support can Elsevier provide? A. The biggest challenge I faced at the outset was that Maturitas was perceived as a women’s health journal, which restricted its focus. I therefore expanded its scope and broadened the editorial board, which is regularly refreshed by junior researchers who are encouraged to join. I also commission review articles to publicise the widened area of interest. Thus, Maturitas is now a multidisciplinary, international, peer-reviewed scientific journal that deals with midlife health and beyond. We publish original research, reviews, clinical trial protocols, consensus statements and guidelines. The scope encompasses all aspects of post-reproductive health in both genders, ranging from basic science to health and social care. Within the first year of my editorship, submissions increased by 50% and downloads by 70%. The Impact Factor has steadily increased and I now tweet via EMAS about selected articles. My main current challenge is to be able to publicize the journal more widely using social media: further assistance from Elsevier would be invaluable. In addition, the speed of manuscript processing and minor language editing could be improved. While I have a dedicated language editor, whom I selected, it would be inappropriate to use him for minor edits which could be undertaken by typesetters. Q.In many areas of research, the growth of paper submissions is outpacing the growth of qualified reviewers and resulting in pressure on the peer-review system. What do you think the solution to this problem is and how do you see the peer-review process changing in the future? A. There are various solutions to this perennial problem which I have deployed, thus reducing the average time to first decision to 21 days. In 2008 it was 61 days. Before passing on manuscripts to the editors, I routinely screen them, e.g. check for originality, look for text similarity with iThenticate, review the quality of the English and take into account ethical considerations etc. As Secretary of COPE and member of the Elsevier Ethics Committee, I am committed to high standards. I aim to provide constructive comments to authors for papers rejected outright so that poorly-presented papers, which nonetheless contain good science, can be reconsidered. This reduces the workload of both editors and reviewers. Thus, reviewers are not asked to look too frequently at papers for Maturitas. The pool of reviewers is increased by constant refreshing of the editorial board and asking junior researchers to review. Currently, we publish around 30% of unsolicited articles. One specific problem with EES is that, historically, different journals have used different logon names and passwords. This has the potential to deter reviewers who are aware that other publishers use single logons and passwords for all their journals. I have not found the Elsevier process of consolidation smooth. It relies on reviewers hunting down their various user names and passwords. During this process some, including me, have been denied access to EES. I am now relieved to know that these problems are being resolved and users now have the option to forgo consolidating their accounts. Q. We have observed that researchers are increasingly accessing journal content online at an article level, i.e. the researcher digests content more frequently on an article basis rather than a journal basis. How do you think this affects the visibility of your journal among authors? A. Access of individual papers is becoming the norm, but visibility of the journal as a whole can be maintained through social media and commissioning timely, high-impact reviews. Q.Recently, there have been many developments in open access particularly in the UK and Europe where, back in July 2012, the UK government endorsed the Finch Report recommendations for government-funded research to be made available in open access publications. The European Commission has since followed suit, making a similar announcement for an open access policy starting in 2014. How do you see these open access changes in your country? And how do you see them affecting authors who publish in your journal? A. Maturitas offers several open access options. Authors or their funders can choose to pay a publication fee to make an article open access. Each month, using Editor’s Choice, a new feature the journal has introduced, I can summarize for the public the most important research published in the journal and the papers are openly available. A. The Impact Factor remains the gold standard, but does not allow consideration of the size of the field and is inherently slow to respond to stimuli. Thus, changes in a journal’s focus will take a few years to become apparent. New metrics include paper views and Twitter as well as other social media tools which are more immediate, but this needs to be taken on board by funders as well as researchers. Elsevier could help editors by providing education on these new tools. The instruction ‘Print or share this page’ could be made more explicit. The Top 25 Hottest Articles for each quarter should be available during the following month. Q. As online publishing techniques develop, the traditional format of the online scientific article will change. At Elsevier, we are experimenting with new online content features and functionality. Which improvements/changes would you, as an Editor, find most important? A. Maturitas authors have the ability to provide AudioSlides. Better presentation of papers with linked references in the margins would help the reader. Those accessing the journal website would benefit from seeing on the page the preview content rather than having to click on it, to stimulate interest. Authors may wish to have links to their webpages. Also, the most cited and read facilities should provide numbers with the title of each article rather than you having to click on each abstract. Thus, as an editor, I would like to have ‘at a glance’ up-to-date tracking of citations and downloads for each article to better profile future commissioned reviews. A. I have recently started with Twitter and LinkedIn using the EMAS portal. Furthermore, since September 2012, I publicize papers published in Maturitas in the monthly EMAS newsletter which is opened by over 30,000 people - downloads increased by 70,000 in 2012. It would be helpful if Elsevier could provide a journal-focused helpline to encourage authors to use social media and have regular calls for papers. A. While journals will become more electronic, some readers prefer paper which can be read in the bath without mishap. Publicizing collections on various themes online is attractive as it allows authors and readers to see the range of a journal at a glance. A. Becoming an editor of a journal is an exciting but daunting task, especially if you are working alone without day-to-day contact with editorial colleagues. The job requires constant attention to detail to ensure publication of high-quality, well-presented material, maintaining the integrity of the scientific record. It is important that editors act politely, fairly but firmly at all times. Speedy communication with authors and reviewers is essential. All Elsevier journals are members of COPE and its website is a source of useful advice. An editor should also act as an educator to authors and reviewers so that young researchers are encouraged to publish and be involved in the process. They are the editors of the future. An Editor-in-Chief needs to interact regularly with other editors and the editorial board, as well as journal and publishing managers. It is a team effort. Editors should not go out on a limb and difficult decisions should be made in consultation.